Rupert Murdoch's News Corp is being sued for buying his daughter's business and giving her a seat on the board. US pension funds allege in a writ that News Corp is "paying for nepotism" and that Mr Murdoch uses the company as a "family candy store". 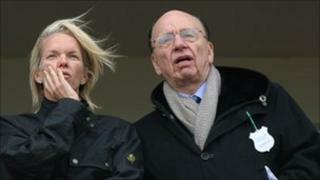 News Corp is paying $675m (£418m) for Shine, which Elisabeth Murdoch built into a successful UK film company. A News Corp spokeswoman told the Reuters news agency the lawsuit was "meritless". Trustees of Amalgamated Bank of New York and the Central Laborers Pension Fund, who are both News Corp shareholders, have filed a lawsuit in a Delaware court. They claim that the takeover deal is "unfairly" priced and that the News Corp board of directors failed to challenge Mr Murdoch about the terms of the transaction. "In short, Murdoch is causing News Corp to pay $675 million for nepotism," said the lawsuit. "In addition to larding the executive ranks of the company with his offspring, Murdoch constantly engages in transactions designed to benefit family members," it said. The lawsuit seeks damages and a declaration the board breached their fiduciary duty to shareholders. The News Corp spokeswoman said Shine was a "very attractive business" that fitted with the company's entertainment portfolio. The takeover still needs approval by News Corp's audit committee and the approval of each companies' respective boards.